A Sunday of Liberty – But we want to be the poets of our life—first of all in the smallest, most everyday matters. But what made him a truly tragic figure was not his physical handicap (of a type that many – perhaps most – of us will experience if we live long enough) but his insistence on dressing like an adolescent in jeans, a flowered short and basketball shoes, with a single, large gold earring and a Keith Richards coiffure circa 1970, except for its greyness. Here was a man who had not (as Mr Blair would no doubt have put it) moved on. He was caught in adolescence as flies were once caught in amber. And this was a tragedy not only for him as an individual but, on the assumption that he was far from alone but rather representative of a social trend, for society as a whole: for as everyone knows, having once been adolescent themselves, adolescence is a time of extreme bad taste and what might be called conformist rebellion, or rebellious conformity. It was a tragedy for him as an individual because it made him dream an impossible but also worthless dream; it was a tragedy for society because it made immaturity the highest good. When I was in my early twenties, I had long hair that reached below my shoulder blades, which I often wore in a ponytail extending out through the back of a baseball-style cap. I preferred wearing XL shirts rather than the mediums which would have fit me. And as silly as it looks to me now, I did favor worn, tattered jeans. To be fair, I worked in my family’s newspaper distributorship, where most of the non-office work was the type to get your hands and clothes dirty. While we weren’t “working-class” (assuming such terms haven’t long-since lost whatever usefulness they once had), we simply rarely had occasion to go around in business casual. I remember one day, walking out of a mall, where I had been collecting payment from one of our client stores. (Yes, this was before electronic billing, back when malls still had bookstores which sold newspapers.) There were a couple of old men perched on one of the benches outside the entrance. As I walked past, one said to the other, in a stage whisper (or perhaps they were both just hard of hearing), “The youth of today!” I thought I could hear their neck tendons creaking as they shook their heads disapprovingly. For a moment, I wondered if it wouldn’t be funny if I walked over and politely explained to them that, yes, while I may look shocking to their sensibilities, I was nonetheless working a full-time job while helping to raise my girlfriend’s three-year-old son, and isn’t that sort of responsibility what’s really important? I didn’t, of course; I just drove off and left them to their bitter reminiscences. Recently, we were in a country club for a dinner and meeting, where the guest speaker was my former philosophy professor. One thing I noticed, because of its incongruity, was how many people, the men in particular, were wearing running shoes with their jackets and slacks. Judging by my own father’s experience with fallen arches causing swollen ankles, I assume this reflects the need for ease of mobility. When walking is difficult enough due to aching, arthritic joints, why compound the misery by forcing your feet into uncomfortable dress shoes for vain appearance’s sake? While it may be true that society collectively promotes and rewards immaturity, it nonetheless doesn’t follow that one can diagnose Peter Pan-syndrome at a mere glance. Whenever Dalrymple seems to lack inspiration for an essay, he resorts to curmudgeonly ranting about how we’re all going to hell in a handbasket because grown men wear jeans and tattoos aren’t just for sailors and prison inmates anymore. It’s an unfortunate reminder that being shallow is hardly exclusive to youth. Of course I knew what to expect when I picked up a copy of Stephen Greenblatt’s Tyrant: Shakespeare on Politics. Still, though, there are times when I feel like turning around to tell Greenblatt that it’s hard to enjoy the book with him leaning over my shoulder, breathing on my neck, trying to make sure that I don’t miss any of the unsubtle parallels he draws. I mean, really — Jack Cade, in capturing Lord Saye, “has in his hands the realm’s highest fiscal officer, the emblem of the swamp that he has pledged to drain”? “He promises to make England great again”? Countless other examples, without being quite so on-the-nose, are still framed in unambiguous ways, as if we can’t be left to draw our own conclusions. Much of the book, simply by virtue of centering on Shakespeare’s plays, is enjoyable enough to read — that is, when the reader is allowed to forget for a moment that THERE’S A RELEVANT LESSON TO LEARN HERE. As it happens, I’ve added Shakespeare to my book-juggling routine these last few months, trying to read a scene here, a scene there, a sonnet before bed, etc. One of the many enjoyable things about doing so is that it’s a break from the incessant cicada-drone of omnipresent, up-to-the-millisecond media and its infatuation with the Eternal Now. At the risk of making it sound like just another utilitarian, productivity-enhancing “hack,” it’s good to spend some time considering the differences between, say, Elizabethan England and our own time. Granted, there are constant themes in human nature and history which we can’t help but notice. But we have to be careful not to force history onto the Procrustean bed of our fleeting obsessions, lest we end up finding social media in ancient civilizations, or Silicon Valley start-ups in colonial America. 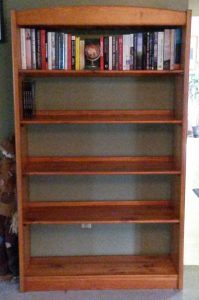 We devoted readers love to talk about our books, but let’s take a moment to appreciate the supporting cast — the bookshelves themselves. I’ve only recently graduated from bookshelf-beggar to bookshelf-chooser. That’s not to say I’ve suddenly acquired taste and discernment, of course, just that I’m no longer dependent upon particle-board shelves from big-box stores. 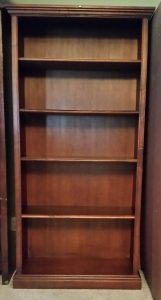 The Lady of the House keeps a Facebook alert for bookshelves for sale within the area, and I’ve found a few really nice ones in the last couple years. I just got this one last week for fifty dollars. Over six feet tall, and made of real wood, even! Look at all that empty space. Doesn’t the potential of it just warm your heart? How many books that I have yet to discover will eventually come to roost there? It was almost exactly two years ago that I got this other one. (It’s long-since filled.) I boasted to a co-worker that it only cost me twenty dollars. Maybe this will become a spring ritual of mine? The air is warming, the earth is coming back to life, people are cleaning out their houses, and library sales are blossoming again. What better way to celebrate than by getting a new bookshelf? Erasmus was weary of the life he had once loved so well. We are shaken profoundly when we read his plaintive prayer, “May God gather me soon unto Himself so that I quit this mad world.” For where had the spirit room to live and to grow, now that fanaticism raged through the land? The sublime realm of humanism which Erasmus had built had been overran by enemy hordes and wellnigh conquered; gone were the days of “eruditio et eloquentia”; men no longer hearkened to the subtle and delicate message of imaginative genius, but turned their ears to listen to the rough and passion-wrought babble of politics. Thought had succumbed to mob-frenzy, it had donned the uniform of Luther or of the Pope; the erudite no longer waged war in elegantly phrased epistles and books, but, like fishwives, hurled gross invectives at each other’s heads; none was willing to understand what his neighbour said, but instead each tried to impose his own pet belief, his particular doctrine, upon all the rest. Woe unto him who stood aside and took no part in the game! Twofold hatred was hurled against those who remained aloof. Those who live for the spirit are lonely indeed at times when passion rages. Who is there left to write for when ears are deafened with political yappings and yelpings? Zweig clearly identified with Erasmus, and it’s even more moving when you consider that he published this book in 1934. Eight years later, he and his wife committed suicide in exile, no longer willing to hope for the return of the cosmopolitan ideal destroyed by the world wars. (Theodore Dalrymple wrote a wonderful essay about him that’s also worth reading.) We are fortunate enough to live in more comfortable and peaceable times, which is why I find it especially hard to forgive those who blow on the embers of ideological conflict out of ignorance, boredom, or both. Today’s political arguments, both professional and amateur, make professional wrestling promos look subtle and subdued. However impractical one might find Zweig’s pacifistic ideal, he was at least willing to die rather than compromise it. The least we can do, in our far more advantageous circumstances, is refuse to dignify today’s clownfights with our participation. In a marvellous short portrait of Conrad, Bertrand Russell said of him, “I felt… that he thought of civilized and morally tolerable human life as a dangerous walk on a thin crust of barely cooled lava which at any moment might break and let the unwary sink into fiery depths.” Because he saw life in such terms, Conrad emphasized the place and importance of work in life. There was, he believed, a particular kind of dignity in the sober exercise of one’s duty in the service of one’s work, precisely because life is such a perilous affair. Conrad had spent the first part of his life as a merchant seaman, and the kind of work he had in mind was largely active, physical work. In some respects he resembled Wittgenstein, who felt that there was something profoundly unhealthy about life as an academic philosopher and who himself gave up philosophy at various points in his life to work as a gardener. There was for Wittgenstein something honest about the kind of labour characteristic of work in a garden. This honesty derived from the sense that the external rhythm of nature, to which the gardener has to be responsive, helps to provide a kind of order to the inner world of the mind. It was also a matter of the fact that gardening provides a focus for the mind’s energy, helping it to avoid consuming itself in its own anxious self-questionings. I don’t like being pressed for time, but I have to admit I do love being absorbed in work, whether paid labor, routine chores, or even exercise. I remember a busy day recently that extended well into the evening, and rather than feeling exhausted or grumpy afterward from the amount of work that had to be done, I felt a rather meditative calm, in addition to the pride of accomplishment. By contrast, I often feel restless on days with no pressing duties. It’s like being spoiled for choice. I can only read for a couple hours before I want to get up and do something else, which is why I prefer to save it for the time before bed. I suppose Aristotle would shake his head and dismiss me as a born beast of burden unsuited for the philosophical life. Well, at least Wittgenstein would have my back. Interestingly, Nietzsche had also wanted to be a professional gardener after resigning his professorship, telling his mother in a letter, “There is no other cure for my health. I need real work, which takes time and induces tiredness without mental strain.” His physical limitations forced him to abandon the fantasy after three weeks, but he retained a fondness for horticultural metaphors in his writing. I recall that Phil Oliver was working on a book about philosophers and writers who loved walking; I wonder if anyone has ever done the same for those who favored gardening? This writer – this intense thinker who perceived that everything was Sisyphean, who proclaimed that the only way to live was to revolt relentlessly against meaninglessness – loved a mere game. Loved it with as much intensity and consistency as he loved anything. Why? Consider this: what could be more absurd than 22 people chasing a sphere of inflated leather around a rectangle of grass for 90 minutes, and believing that the amount of times said sphere crosses a couple of painted lines is a matter of the most profound importance? In any sort of rational analysis, football is fundamentally ridiculous. A flurry of imaginary meaning. This seems unnecessarily cerebral to me. Owen makes many interesting points about why “a mere game” can have such a hold on our attention and energy, but he never mentions the simplest one: it’s fun. Fun is too banal a concept for analysis, I suppose. Even our pets intuitively understand fun. If my cat could talk, I’m sure he’d say that it’s just plain fun for him to jump up, skitter across the garage floor, and start batting a pebble around for a few seconds. Writers and thinkers tend to be dreadfully serious, which means they dare not risk looking frivolous by suggesting that some things simply are as they appear; they stand on their own merit without any need for theoretical scaffolding. Games are meaningful in a different way than careers and relationships; they’re not all competing in a zero-sum fashion for the same goal. What he needed was to work in the shadows while another wielded power, he himself holding aloof from responsibility, reading noteworthy books within the four walls of a quiet room, writing works of his own invention, to no man subservient, beholden to none—and such was Erasmus’s notion of an ideal existence. There should be a particular word for that unexpected and poignant sense of kinship across centuries, where despite all the temporal, linguistic, and cultural differences, you feel like you’ve shared a knowing glance and a smile. I am outraged at some injustice. The injustice is real, maybe even written on the face of a person mocking another culture or ethnic group. My blood rises, and I reach for my judgment, my condemnation, then pause. I reflect. Have I ever wanted anything that would make another person feel the same way about me? Yes, okay, sure, I admit to myself. But that’s not the point, I tell myself. Is it not? What would have helped me to see my own error? What would have spread more goodness: someone enraged, shouting at me because of how bad I was? Or something else? Just that movement of the mind, of the soul, of the frail human heart, softens our impulse to spread anger and rage in the name of justice. It might lead to a different judgment, or none at all. I can’t say how it will or should play out for other people. I can say its very practice will reduce the regret we’ll have every time we undertake the harrowing exercise induced in the beginning of this essay. It will make us kinder, more understanding, and, crucially, more just in our dealings with injustice. I read this admirable essay earlier this week, and I returned to it several times after. I had been far too busy to organize my thoughts about it, but then, as if on cue, the Roger Scruton hit piece in the New Statesman appeared, resulting in his dismissal from his unpaid position as the chairman of a British architectural commission. It’s very easy to be outraged by the whole sordid affair. Scruton is an exemplary man, writer, and philosopher. A journalistic nonentity named George Eaton blatantly misrepresented Scruton’s statements for the purpose of getting him fired and was crass enough to gloat about it on social media afterward. The sheer vindictive pettiness of it all, the refusal of the left to tolerate a prominent conservative’s presence even in a largely symbolic capacity and the cowardly capitulation of a Tory government, is nauseating. But I have to admit there was a time when I would have unthinkingly considered someone like Scruton a bigot for opposing conventional left-wing pieties. I could have easily been part of the group of people cheering Eaton on, competing to impress my peers with my witty put-downs. If I had been aware of the underhanded tactics involved, I’m sure I could have easily rationalized those as necessary for the greater good, but it’s even more likely that I would have been securely ensconced in what we now call a filter bubble, where I would have never encountered anyone pointing them out to begin with. If my every stupid remark and callow judgment had been frozen in social media amber for public display, I too would look like an awful person. Blogger, critique thyself. “Yes, okay, sure, I admit to myself. But that’s not the point, I tell myself. Is it not?” Here, too, it’s easy to blow past the acknowledgement of the obvious in order to return to the serious business of being angry at injustice. It’s easy to rationalize once again why this injustice is serious and deserves an appropriate response, rather than a lot of vapid relativism on how none of us are perfect. A practical response might be to acknowledge one’s own powerlessness in such matters and focus on the quotidian details of one’s own garden instead. It’s certainly healthier than fuming impotently. But even that might only be a way of avoiding the point. I might be just mature enough to recognize that there’s no use in being enraged about things I can’t do anything about, but if I believed for a moment that I could do something…well, I’d probably be just as angry and self-righteously vindictive as the next guy. So, then — do I want to take the time to contact just one of the many people I saw on social media exulting over Scruton’s firing and attempt to explain, patiently and kindly, why he or she is mistaken to feel that way? Of course not. Like I said, I’m busy and tired and barely have enough time to read and write for pleasure as it is. Why would I want to devote any of my limited free time to a likely-fruitless conversation? And yet, I do find that even the idle thought of doing so seems like a better use of my imagination than indulging in fantasies of seeing the wicked receiving their comeuppance. Maybe that’s something. What helped me to see my own errors? It was, and is, a cumulative process. There are rarely any thunderbolts of enlightenment, just a gradual, barely-perceptible dawning. I think that a significant factor was that I can’t recall ever being humiliated for being wrong. I was either fortunate enough to never say anything stupid in front of someone who could have made a brutal example of me, or fortunate enough that they chose to pass over my stupidity in graceful silence. I was allowed to outgrow errors at my own pace, I suppose, maybe even allowed to forget having made them and thus preserve a fragile sense of confidence and dignity. Perhaps one of the worst things about social media is the way it forecloses on the possibility of that productive forgetting. Your errors are forever as loud and fresh as the moment you made them, with vengeful enemies devoted to rubbing your face in them. Perhaps it’s better if errors are simply allowed to outlive their usefulness and then slink off to the woods to die alone and forgotten. That’s offensive to the progressive notion of history as a cumulative elimination of error and injustice, of course, but funny enough, that’s one of my own errors which died of natural causes. In favor of the idle. An indication that esteem for the meditative life has decreased is that scholars today compete with active men in a kind of hasty enjoyment, so that they seem to value this kind of enjoying more than the kind that actually befits them and, in fact, offers much more enjoyment. Scholars are ashamed of otium. But leisure and idleness are a noble thing. If idleness is really the beginning of all vices, it is at least located in the closest vicinity to all the virtues: the idle man is still a better man than the active man. You don’t think that by leisure and idling I’m talking about you, do you, you lazybones? Leave it to academics and intellectuals to make the concept of “doing nothing” seem both exhausting and incomprehensible.